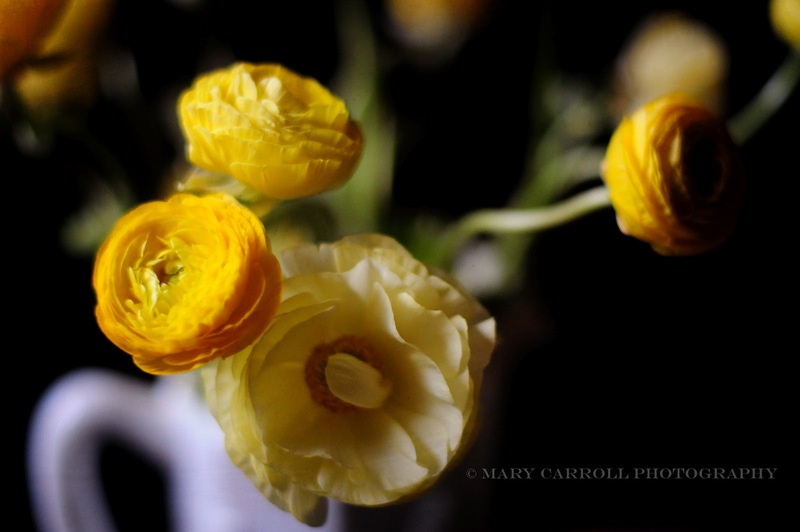 Your ranunculus photos are dreamy! Sorry about your hand, Happy Mother's Day! I love ranunculus are gorgeous. Wish I could grow them. 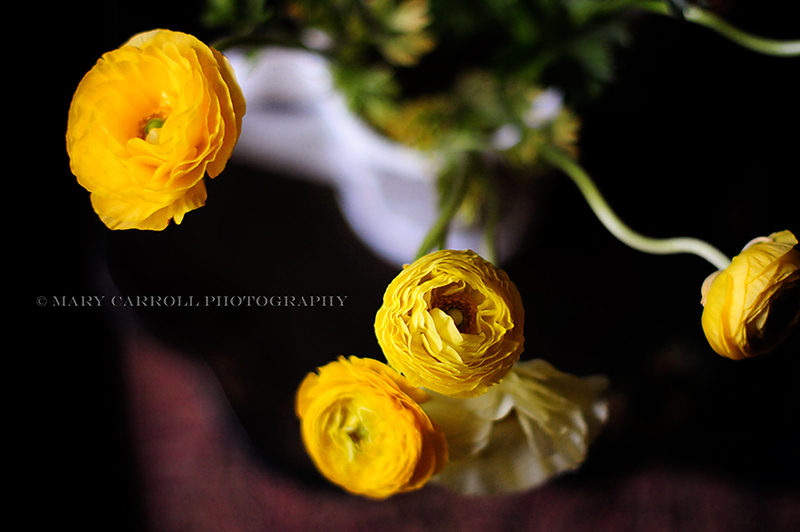 I love ranunculus and these are gorgeous. Don't put off taking care of your hand!!!! Lovely blooms, Mary! Happy Mother's Day! Who could tire of these golden drops of sunshine? Hope you can get to the bottom of the problem with your hand. Thanks for sharing your renunculus -I looked for some this year, but no one seemed to be carrying them. Hope you find the problem with your hand and it gets better. Please delete No. 11. I don't know why I can't seem to get it right!!! No. 13 is the good one. These are gorgeous yellow flowers, Mary! Happy Mother's Day..
Beautiful. I am so sorry your hand is still giving you so much trouble. I hope you do see the doctor and he will have some good ideas for relief! I hurt my elbow last summer while in Scotland and waited so long I barely have any strength left. Please visit the doctor and do wait as long as I did. Hope you had a blessed Mother's Day. So very pretty. I hope your hand feels better. Sorry your hand is still giving you trouble, I do hope you get some relief. Wishing you a happy Mother's Day. Such pretty flowers. You need to see the doctor, Mary. They'll probably order an x-ray and you can go from there. Lately, my right hand has been bothering me too and it's kind of scaring me because I use it in my job, and for photo editing. I can't lift the things I can with my left hand. Afraid it's arthritis. Good luck! These are scrumptious images here. Thank you for sharing them, despite having to use your hand. Well, my friend, I do not mean to nag, but I think it would be wise to call the doctor in the morning. You've been very patient. Thank you for the sweet Mother's Day greetings; I hope that you had a lovely Mother's Day as well. Happy Mother's Day, Mary. I'm so sorry your hand is still giving you problems. Please do check it out before it gets worse. Mary, Your flowers are gorgeous. 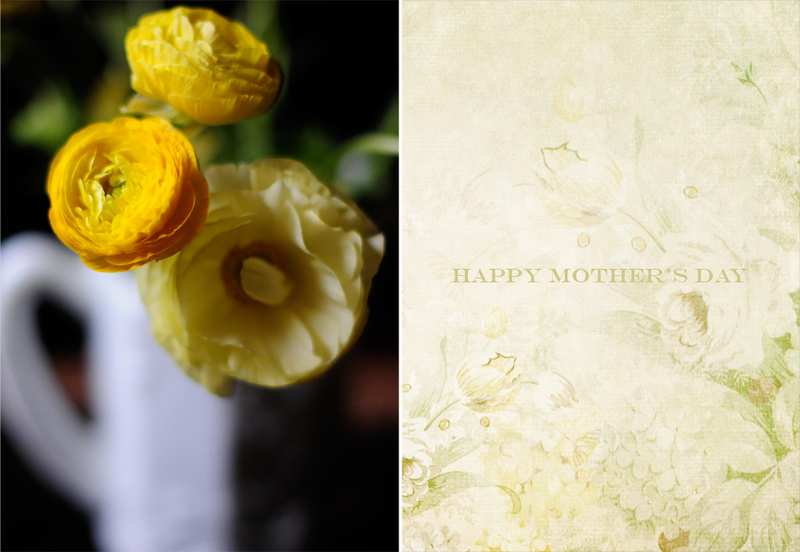 I hope that you had a lovely Mother's Day. I am sorry that your hand is still giving you pain. These flowers are beautiful. I have never heard this name before. Maybe we call them something else. So sorry the hand is still bothering you. Mary, you are as bad as my husband! Don't make me have to get after you to go to the Dr. too?? Your mosaic is beautiful please don't feel guilty for such beauty! Get some pro. advice on that hand, your fans want you to feel good!! Have a good week,dear!! Thanks for hosting M.M., it's my favorite meme!! These flowers are so cute! Lovely Mother's Day card. Hope your hand will be better soon. 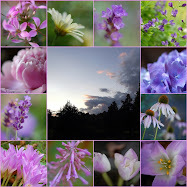 Your photos are always so lovely. i hope your hand feels better soon. I've been there. Have a beautiful week. Wow. This is my first visit here. It is all so lovely. It feels so calm and soothing here. Thank you for this gift. such gorgeous colours and light, really lovely, hope you get your hand sorted out soon, it sounds so painful! So very beautiful, ranunculus are amazing flowers. Mary, I have rheumatoid arthritis, the illness started 12 years ago when I was 36 years old. I urge you to see a rheumatologist, not just a general doctor, ask to see a rheumatologist. Maybe you don't have RA, but one of the biggest symptom of RA is pain in the fingers and hand, especially if you have it both sides. They have many drugs available and these drugs give me a quality of life I wouldn't have if I wouldn't take them. Even if it's not RA, don't endure the pain, you are maybe putting your fingers at risk of developing more problems if you are not treated. I know we don't like to take drugs but sometimes it's the only way to have a better quality of life. Please take this advice from someone who lives with RA and know how you feel : Go see a rheumatologist.